MallStand is a revolutionary web and mobile social shopping platform that will transform traditional online shopping. MallStand is striving to recreate the mall hangout experience that so many Americans have enjoyed for decades. At MallStand users can socialize with friends, find detailed information on thousands of products and merchants, compare product prices, share popular items, order food from local delivery spots, and even participate in daily social deals where more friends equals a better discount. By utilizing various social networking tools, MallStand creates a unique environment that fosters communication between consumers and merchants. This platform provides shoppers with a centralized online location to mingle, shop and share. 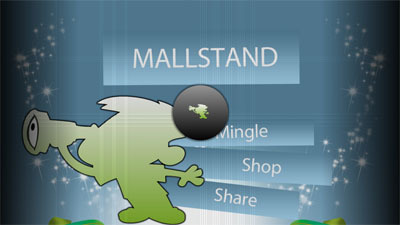 MallStand.com is the convenient ‘one-stop shop’ that meets all of your shopping needs. MallStand brings together the users and the merchants and ultimately offer an overall better user experience. We are recreating the mall hangout experience that many Americans have enjoyed. We provide users with a way to socialize while they shop and we even make it easy to order some of your favorite foods to be delivered right to your door. For merchants, the use of social networking features on MallStand allow merchants to communicate easily with their customers; they can easily notify customers about sales, new inventory, and much more. Merchants have brand pages which allows for further promotion of your brand for free. There are no upfront costs for a merchant to join. In addition, we only charge a small percentage per sale made by the merchant.